A curve, which can straighten everything. Unfortunately, time can erode teeth and this affects our smile, our eating habits and our health as well. Proper dental care can prevent our teeth from becoming damaged. Despite this care, we still may need teeth replacement. We are going to help you to find the best place to get dental implants! Old-fashioned replacements and removable dentures are not always the best aesthetically and functionally. Exposed metal parts and moving dentures can cause a lot of inconvenience for patients who must wear them. This is the past now! Nowadays, thanks to modern technology, a wonderful smile and the proper ability to eat at any age is not a dream anymore. We can forget the denture adhesive, the exposed metal parts and unpleasant situations too. Dental implants do not only look exactly like natural teeth, but they are also durable and strong. Only the cost of the treatment can be a constraint. In fact, depending on the number of teeth implants the intervention can cost almost a fortune. But there is also a solution! All you need to do is travel a little. Nowadays, several countries have become targets of health tourism, because it is cheaper to get access to high quality treatments and long lasting results. Dentistry is one of these areas since the treatments have long-term results. In addition, with the help of modern communication possibilities, it is no longer necessary to have your dentist within reach. The inserted implants usually come with a 10-year warranty, so you do not have to worry about the results. By plane, we can be anywhere in the world within a few hours. To top it, thanks to low-cost airlines, travelling is cheaper than ever. That is why the price of health care services abroad still do not reach the average prices of treatments in your home country. In terms of accessibility, Hungary can be a perfect destination to get dental treatments, as you can arrive in the Hungarian capital from London for example in just under 2 and a half hours. How to find the best place to get dental implants? Before a serious intervention like a dental implantation, you most probably are full of fear already in our country, not to mention if you are getting dental implants in Hungary. This is normal, but you do not need to worry if you receive all the needed information beforehand. Communication is the most important factor: You need to know what we can exactly expect, what will happen, when it will happen and how it will happen. All of our clinic professionals speak fluent English, so you if have any questions, we will answer all of them. The second important factor is trust. You need to know that you are in good hands. Hungarian healthcare professionals, including dentists, receive world-class education; the universities all over Hungary are known world-wide. Hungary is a member of the European Union, which is why the treatments follow the standards and protocols of the European Union. 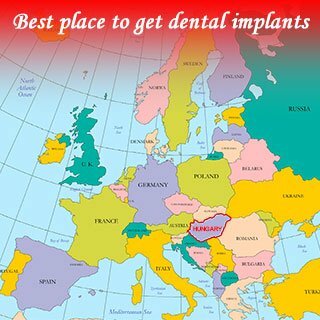 These are some of the factors that make Hungary the best place to get dental implants. Our clinic only uses the highest quality materials for a tooth implantation, it is one pillar of our quality guarantee. The other pillar is our experienced and knowledgeable staff of professionals, who ensure a smooth procedure and completion of the treatments; from travelling to Hungary, through the surgery until the journey back home. An assistant will be available to you throughout the procedure. She will take care of the organization of your journey, a driver will be awaiting you at the airport. You will also be given an accompaniment for the treatments, so you can always feel safe. Based on the opinion of many satisfied patients, we dare say that we are the best place to get dental implants at if you want high quality care at an affordable price. Depending on the type of the intervention, we can solve your dental problem even with just one visit of a few days to make you able to smile again!